So after maybe a half dozen mortises mostly in poplar, and 90% of one in maple this is the condition of my edge. At the time I'm thinking Ray Iles and his D2 steel aren't living up to expectations. While working in maple has been literally tough, I wasn't expecting it to beat the edge on a beefy English mortising chisel. I've since had another read of Mr. Moskowitz's site and think I need to hone a micro-bevel on this bad boy. This is the sharpening and honing I did before contacting Joel. The timeline is a bit disjointed in that I took these pictures late last week, and determined part way through today that I should drop him a line with some pics. In the meantime though I had another 3 mortises (and 4 half blind tails) that needed chopping so this is what I used for the job. I'll say after the aforementioned joints were done, the edge is looking rather ragged. Not chipped so much as just plain ragged. You have too look pretty close, but it's not pretty. It's definitely still sharp, but I'm hoping a new micro-bevel will cure what ails my poor chisel. On an aside, I'm not 100% clear on Mr. Kell's honing guide. His instructions indicate the bottom of the chisel or plane blade should be used as the datum against the guide spindles. Joel's pictures show the top face being used as the datum. 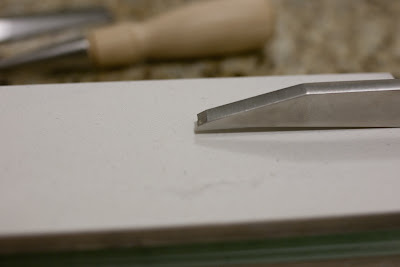 I tried both, and ended up doing a lot of grinding on my 1000 grit stone to set and re-set the primary bevels. 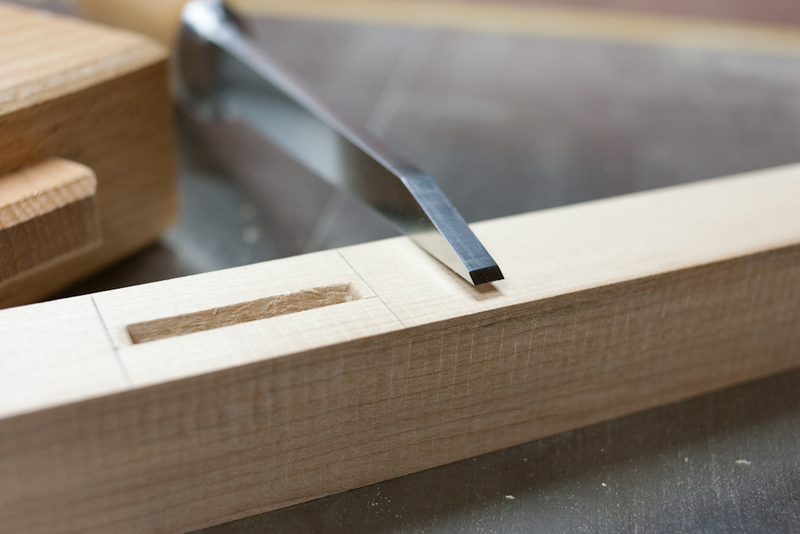 Once because the bevel was no longer square to the chisel sides. Labels: Ray Iles "Tools for Working Wood" Chisel Mortise "Richard Kell"